Chop peeled potatoes into bite size pieces. Starting with a pot of cold water, add peeled potatoes into the pot and heat on a medium to high heat. Ensure that the potatoes are submerged under the water. Bring to boil and leave them to simmer for around 15 minutes, continually checking on them to ensure they aren’t over cooked. 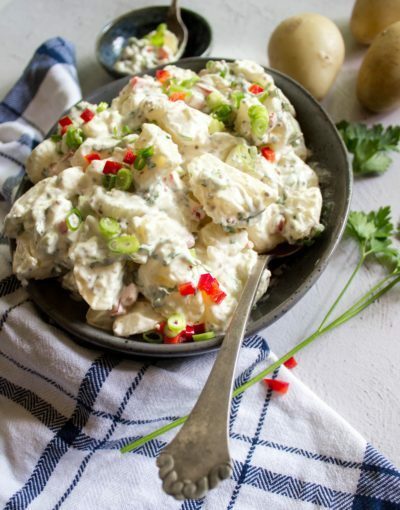 Whilst they are cooking, add mayo, sour cream, olive oil, mustard seeds, spring onion, parsley and capsicum into a bowl and mix – this is your dressing! Take the potatoes out of the pot once cooked, and leave them to completely cool. Pour dressing over the potatoes and mix thoroughly. Sprinkle a little salt and pepper and serve up!